Up until recently, I was convinced the waters of Port Underwood were the aquatic equivalent of an arid wasteland. Absolutely swimming with kelpie – but technically they’re more vegetable than fish. Last weekend, Husband deemed conditions ‘ideal’ for fishing. Well, he says that every time, but the signs were good: it was on the turn of low tide, there was a gentle swell and visibility was good. Still, I brought my book. Which is probably why WE CAUGHT FISH! You know, in the same way as ensuring fine weather by packing an umbrella, or minty fresh breath by sucking on a haddock. See, I don’t understand where that analogy went so wrong. 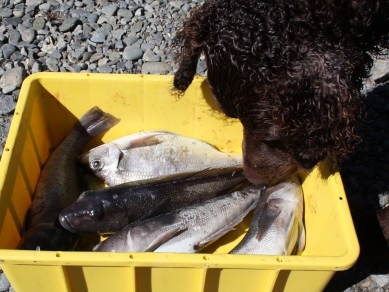 We caught a terakihi and four blue cod, returning seven that were only 1-2 cm shorter than the legal limit of 33cm. When I say ‘we’, I do of course mean me. I catch more fish than Andrew because I bait the hook with chunks of finger, which appears more tempting than squid. Also, I practice a form of psychic fishing which involves visualizing the fish trundling around the sea bed and willing them to impale themselves on the hook. It is frankly uncanny the number of fish I hook through an eyeball or gill or the tail. When we got home, I called my stepfather-in-law in a high state of excitement to grill him on how to grill a terakihi. “How big’s it?” he growled. I’m so totally lying. I’d never say that to Agent of Death, not even on the phone. 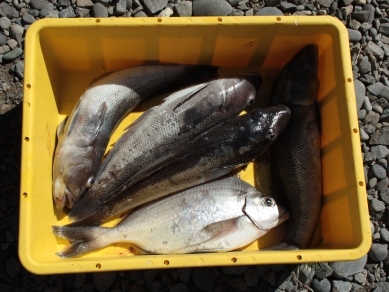 Four days later, Agent of Death went fishing off Oamaru and, in the space of two hours, caught 40 blue cod and 20 sturgeon or something. Yeah well ah, you know, I’m more interested in quality not quantity. Psychic fishing? and there was I thinking that, since you brought your book, you had been reading to them either excerpts from “Smart Casual” or “About Time”. I’m rather impressed with your fish haul even if you had to return seven of them. Sometimes I sing to the fish, but Andrew threatens to join them. I need to get better at reading, or at least give it more time. First I read that Andrew threatened to join in. I could not help but feel sorry for the fish, but then I saw that he threatened to join them. Phew, he has sense after all. Of course I don’t know, but you both could have mega stardom potential in your voices. I’ve always thought Andrew has mega stardom potential in his voice. He totally sounds like a cartoon character called ‘Botbot the Robot’ which seems destined to be a global smash.